Our references include more than 150 process columns for the Refinery, Petrochemical, and Fertiliser sectors in India and abroad since 1963. VTV’s Fabrication Plants in Vadodara, Kandla and Jamnagar are equipped with modern equipment and strong engineering, manufacturing and quality control teams to provide high quality service for a wide variety of shop fabricated equipment. 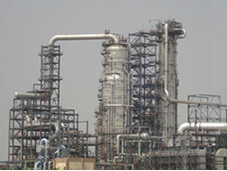 We have also pioneered the concept of Field Fabrication of Over Dimensioned Equipment in India and have executed all such major equipment fabrication work for IOC’s Panipat Refinery Expansion Project in 2004-05. These included the CDU/VDU Columns, Coke Drums & the Paraxylene & SRU Unit Columns. 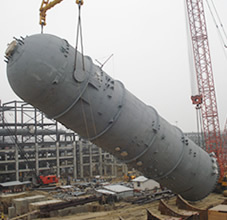 We have since executed major EPC contracts for Columns for a Naptha Cracker Unit for IOC/TEC & Coke Drums for a DCU Unit for BORL/Naftogaz. With an extensive range of mobile fabrication units and the capability to virtually recreate Plant facilities on the project site, we deliver a new level of economy and control to customers for their most critical equipment requirements.